TIM SLADE, Nick Percat and Nick Foster each have separate reasons to look forward to their return to the Liqui-Moly Bathurst 12 Hour next February. The trio will drive a Ferrari 488 GT3 for Taiwanese team HubAuto Corsa, a leading force from the Blancpain GT Asia Championship that will make their Bathurst debut next February. 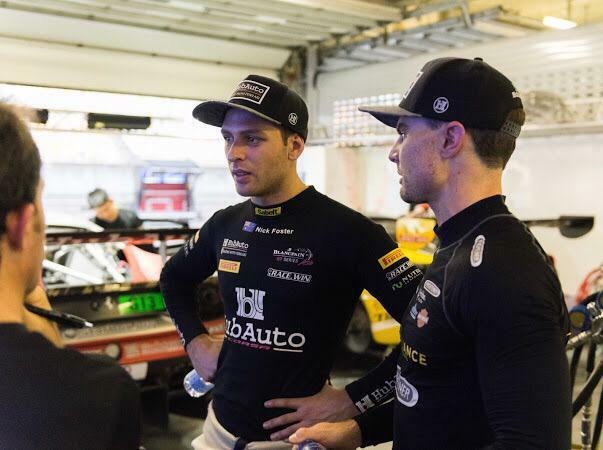 Slade and Foster raced for the team throughout 2018, while Percat will make his first GT3 start in an outright car when he joins his teammates at the event. Though unfamiliar with the team and the car, Percat’s relationship with his new co-drivers is a different story. While he and Slade headline Brad Jones Racing’s Virgin Australia Supercars Championship campaign, Percat and Foster also have a lengthy relationship. “I haven’t worked with Foster since Formula Ford, when I used to spanner his car,” Percat told Bathurst12hour.com.au of his time at title-winning Formula Ford outfit, Sonic Motor Racing. Percat, a former winner of the Supercheap Auto Bathurst 1000, admitted his relationship with Slade – who joined team owner Morris Chen in HubAuto’s Pro-Am combination throughout this year’s Blancpain Asia championship – helped ease his way into the outfit. “They have factory dudes drive their cars all the time so it’s a good opportunity for me. The connection with Sladey made it a little bit easier – any questions they had he could answer. We spoke on the phone and email and it was an easy fit. “I’m going to get up there and do what I can,” Percat added. “But I’m really looking forward to watching Nick and Sladey behind the wheel.. they can do all the laps, I can watch the thing go hard! While Percat’s single 12-Hour start ended with a non-finish after one lap of the 2016 race, Slade has established himself as one of the most experienced Supercars regulars in GT3 machinery. 2019 will mark his sixth start in the race; two coming with Erebus Motorsport’s Mercedes AMG entries and the last three years in Tony Walls’ Objective Racing McLaren. Slade said he had fond memories of working with the always-quick if perennially unlucky McLaren team. The car was in contention for at least a potential podium finish this year before a broken starter motor ended their race at the final pit stop, almost within sight of the field. “We always had a lot of potential there with Wallsy and McLaren,” he explained. “Between Tony and McElrea they run a really good show and there’s never anything spared but unfortunately we were unable to come away with a better result – there was always something that hampered progress. But I have to thank Tony and his team for having me, it was a great experience. Despite the outfit entering only their second year of racing with the Ferrari 488 GT3, Slade said the team lacked nothing compared to their direct GT3 rivals. “They are a really good team and I’ve loved everything I did in Asia with them this year. They’re a great bunch of people, they have all the best gear and they’re lacking nothing. I’ve been in a few different reams now but you never walk away thinking that they are missing something. “I think it will be nice if we can go under the radar during the week,” He added. Former Porsche Carrera Cup Australia Champion Nick Foster has headlined HubAuto’s attack for the past 12-months, including several starring performances in the Blancpain Series and in the Suzuka 10 Hours – the Asian leg of the Intercontinental GT Challenge. He and Slade teamed up to win the Taiwan Festival of Speed in a Ferrari last year before linking again for the Blancpain campaign this year. “We go way back! Sladey and I have been mates for a long time and have always spoken about driving together,” he said. “We won the Taiwan Festival of Speed together – that was something like an after-the-season race for us and driving a car that was quite unlimited! To join up with him again but in a major race and against a pro field will be very exciting. Foster, who like Percat has just one 12-Hour start to his credit however has won a Formula 3 race on the Mountain, is perhaps best placed to assess the team’s chances going into Australia’s International Enduro. “In terms of the team and where we started twelve months ago with the Ferrari, Bathurst will mark the first anniversary of it all happening,” he explained. “We’ve come a really long way. The results have been strong from the get go and we hit the ground running. We fell short in the last race of the championship but to finish second overall was really positive. “But we got to go and have a stab at the Suzuka 10 Hour and that proved the calibre of our little organisation. HubAuto Corsa’s entry into the race marks the return of the Prancing Horse to Bathurst; the brand having no representation in the 2018 race despite winning it a year prior.